Winnowing out the squirrels? Ushering in the cardinals? I have hope! 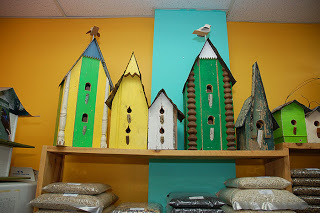 I made a trip out to a great resource for bird feeding in Toronto yesterday, a store in north Toronto called Birdwatch. 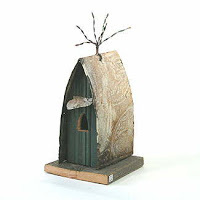 It was freeeeezing cold, minus 20 windchill outside, but inside the shop was full of harbingers of spring: wildly creative bird houses galore, and a beautiful metal birdbath created by metal artist Dog Bite Steel which I’d love to see in my garden. At $300, a little out of my price range at the moment. But one of these days…. My new squirrel strategy is distraction: give them something to make them happy, but keep them away from the platform feeder which is the main draw for cardinals and the odd bluejay. So I stuffed peanuts to the brim in my squirrel feeder. It’s the kind with a lid they have to lift, which has the bonus of being more entertaining for my cats, who monitor my bird feeding site for a good part of the day. The saleslady at Birdwatch mentioned that all the seed they sell is especially fresh. They also recycle their plastic bags, and give a 5% discount on seed to regular customers. 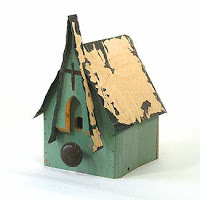 They also sell, books, gifts, bat houses, binoculars and all kinds of bird feeders. 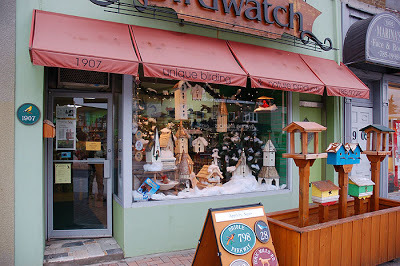 Birdwatch is located at 1907 Avenue Road, and they have a little parking pad at the back of the store, so it’s easy to get a big bag of sunflower seed to the trunk. Come for the seed, stay to drool over the one of a kind birdhouses and other birdwatching/feeding paraphenalia. I just found your blog and just love it. 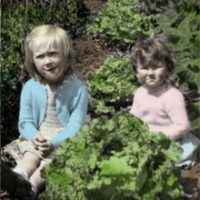 As a new-to-Toronto gardener, I’m finding lots of great tips. We are no fans of raccoons here, either. We have a few raccoon posts you may enjoy. I haven’t had any raccoons at my bird feeders as yet in my neighborhood. We do have a TON of raccoons, but miraculously they don’t present a problem this way. I think the raccoons prefer bigger fare than seeds. Squirrels, on the other hand…..they tend to clean my feeders out quite a bit. I try to put out extra so there’s some for the squirrels and the birds. I’d say, go for it, you may find the raccons don’t bother your feeders. Thanks – I’ll give it a whirl and perhaps consult with the folks at Birdwatch. I’d love to encourage more birds to hang out in the backyard, plus, the indoor cat would love the tv. Your posts on raccoons were very funny (or not, as the case may be!) I see that I will have to guard my tulips with extra vigilance – I’m working on that Linda Blair hiss right now!